If you are going to revamp your menu, carry it through!! 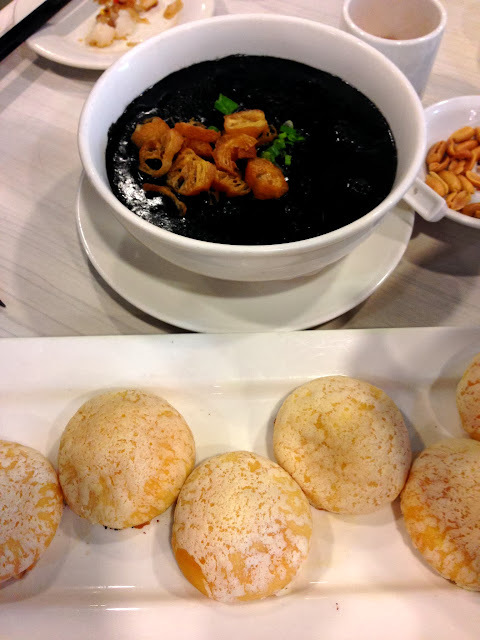 Dishes that I read about online (squid ink cheong fun, rojak carrot cake) were not available. The best part was when I got quizzical looks from the staff like I was the weird one there. The fried carrot cake that finally arrived was pretty good. And so was the squid ink char siew bao (surprise surprise!). But nothing else is really worth ordering in my opinion. I made the special trip down for their liu sha baos but this is a case where photos from other blogs did the dish too much justice. Ours didn’t look fresh for whatever reason. Full of molten salted egg goodness but it was way too oily (more oily than the version at victor’s kitchen) and there was nothing to soak up the yolk! It was still good la. But (I can’t believe I’m saying this) a bit too jelat and in general, it just wasn’t of good quality. Food wasn’t terrible of course. Just average. And skip the gimmicks. I fell for every single one of them (of course) haha. Oh and if you are wondering about the squid ink porridge- it tastes like the usual porridge we have.